[Martin] McDonagh’s sense of morality readily lends itself to entertaining plot turns and impressive acting. He leans into the kinds of vicious, manipulative contradictions that make melodramas so powerful. But in this case, his predilections only lead us down a rabbit hole of dumb ideas, symbolic ironies that really only make sense to people with $80 screenplay software on their MacBooks. Or is this the kind of advice you get when you stick to the free trial? Keep a lookout for every time a cop fucks up in Three Billboards. Chances are there’s a black person hovering somewhere in the background, playing silent witness, to make a point of that injustice. To whom? I’m guessing not to those black people: They’re merely props. What about when an aggressive police interrogation is cut short because the cancer-ridden Willoughby coughs blood right into Mildred’s (Frances McDormand) face, a stark—you could say aggressively simplistic—reminder that, even if he’s wrong, he’s merely human? The worst moment in the movie is a flashback to Mildred’s argumentative last words to her daughter. They’re arguing over Angela borrowing Mildred’s car. Mildred tells Angela to walk. “I hope I get raped on the way,” shouts Angela. “Well, I hope you get raped on the way, too!” The line gets the response it’s going for: ouch. The malignant irony of this being a mother’s final words to a daughter who winds up getting raped and killed couldn’t be more clear. What’s obscure, in these contradictions, is McDonagh’s endgame. Is there someone out there who believes cops can’t die of cancer or have a sense of humor? 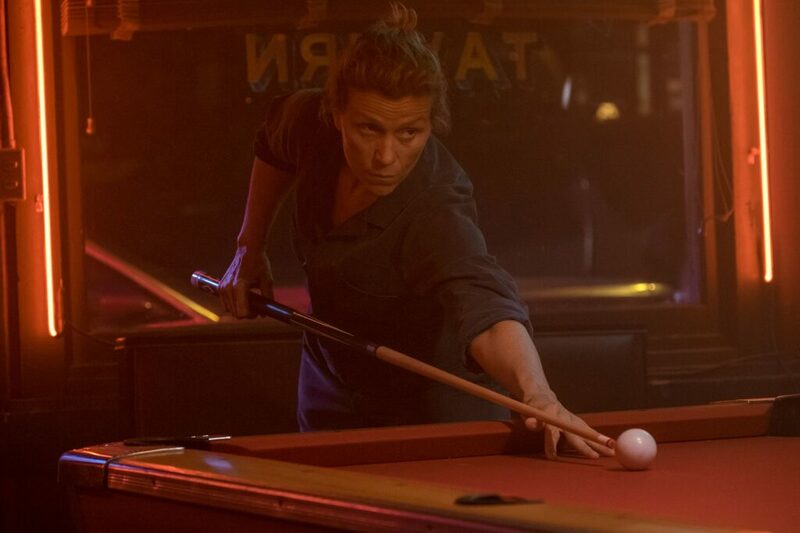 Because Three Billboards is the kind of movie to want to milk that seeming contradiction in terms—cop on the one hand, human on the other—for more than it’s worth. The problem with most redemption narratives, besides the fact their emotional range seems calculated to win awards, is that they bask in the seeming paradoxes of their premise: When you’re literally the worst, it’s counterintuitive for us to see you in any other light. So you give a torturer disguised as a cop a heart of bronze, if not quite gold, and on the flip side, you give a grieving mother an anarchic streak. Rather than give his characters ideas that complicate our sense of who they are—ideas about justice, punishment, fairness, even redemption—McDonagh keeps riffing on the same preordained arcs. It’s entertaining in the moment, but by the end, the movie verges on false equivalencies I can’t really forgive. As one character spirals downward, another ascends. They meet somewhere in a vague, indeterminate, and sort of nonsensical middle. It feels like ambiguity, but rather than reveal moral truth, it merely exemplifies McDonagh’s clever engineering. To read the rest of K. Austin Collins’s review click here.